On paper the looks like a truly awesome knife. Made in Golden Colorado, its light weight and small footprint make it ideal for EDC while it’s S30V blade is made from some of the finest knifemaking steel money can buy. When you consider that the knife bears the Spyderco name and can, it seems like an obvious choice. However, all that glitters isn’t golden (even S30V). Lets take a critical look at the Native to see if it is really the holy grail of EDC knives. The Spyderco Native has a 3 1/8″ blade, an overall length of 7″ and a weight of 2.65 ounces. 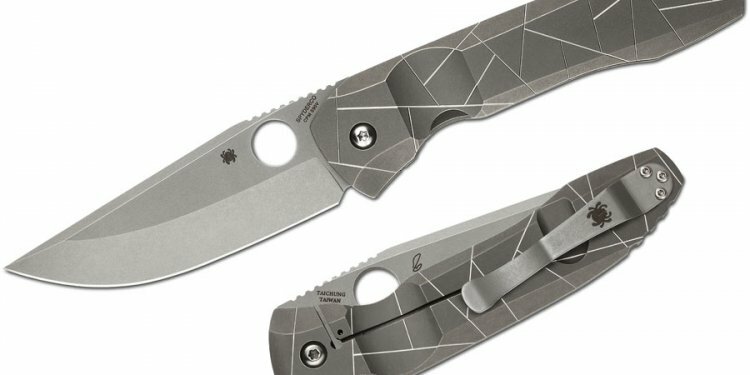 This design is lightweight and has a good sized blade for EDC, while still being a very slim knife that will slip easily into the pocket. The blade is a drop point design that has a hollow ground edge that begins about halfway down the blade. The weight of the blade has been further reduced with an aggressive swedge on the top of the blade. This swedge looks like it could be sharpened although that would be impractical as both a folding and an EDC knife. Spyderco selected CPM S30V for the blade steel. S30V is an exotic and incredibly durable steel that will hold an edge very well. It is still relatively easy to sharpen and has good corrosion resistance. No doubt the choice of steel is a major attractant as it is one of the more expensive steels. The knife performs well. The edge is very sharp and it can easily shave hairs. The hollow saber grind has a surprisingly difficult time cutting cardboard (perhaps because the cardboard will bind up at the top of the saber grind) but will be more than adequate for most common cutting tasks. The Native, like many Spyderco Knives, was designed to be an extension of the hand. In many ways Spyderco accomplishes this, the handle is made of a single piece of Fiberglass Reinforced Nylon and is well textured with signature Spyderco Bi-Directional texturing. The handle is indeed very grippy and it feels secure in hand. Spyderco also included two finger choils to facilitate a firm grip and aggressive jimping on the spine of the blade. These handle design features are all well and good, and I appreciate the effort Spyderco put into designing this handle, however, the finger choil closest to the blade (and is indeed part of the blade steel) is simply too small, making it uncomfortable to jam your finger into it to really choke up on the blade for detail work. Additionally, when you do choke up on the blade, your thumb is in a position where it is not on the jimping. This defeats the purpose of the jimping and makes your thumb slip along the spine of the blade. Granted, you are only going to be using these kinds of grips for heavier duty work. If this folder is not going to be used every day to slash cardboard and do a lot of controlled detail work (like say, carving) then these issues will probably not be a big deal for you. However, if you want to use this as more of a work knife, you may find the knife to be somewhat painful to use. One other detail about the handle that I have to mention, is the absence of liners. The knife appears to be very strong, but I know a lack of liners will be an issue for some, so if you are thinking about purchasing the Native please keep that in mind. The pocket clip is a standard Spyderco clip. It is well designed and comes in a glossy black. It allows for ambidextrous tip up carry.